Friday, May 11 - Glen Ellyn Housewalk - 10:00am-2:00pm, 5:00-9:00pm - Marcel's is a proud sponsor of the Glen Ellyn's Infant Welfare Society's 2012 Housewalk. We have the privilege of enhancing each home's beauty with Marcel's merchandise staged in kitchen, dining and outdoor spaces on the walk. Attend and be inspired! Tickets are $30, all proceeds go to Glen Ellyn Infant Welfare Society and can be purchased at Marcel's. Thursday, May 17-Sunday, May 20 - Taste of Glen Ellyn - Live music, good food, and entertainment for all ages awaits you at the Taste of Glen Ellyn. Visit the Glen Ellyn Chamber of Commerce website here for more information. May classes honor mothers and offer delicious inspiration for your spring celebrations. Looking for the perfect Mother's Day gift? Look no further for inspiration to honor mom. Chef Katie pays tribute to mom in Oh Baby! (5/6) and Mother/Daughter Luncheon (5/9), Chef Kelly in Thanks Mom! (5/11), and Mom & Me (5/12). May also offers its book club class, In Mother's Kitchen (5/22). Put a modern twist on grandma's favorites with Chef Jamie in Something Borrowed (5/10). (click here for more). After the guest list and menu choices are made, “shop” your garden to create a tablescape that will enhance the festivities and make the party memorable. FULL STORY. As we celebrate our mothers this month and also fully delve into our gardens, not a day goes by that I don't think of my mom, Susanne. Susanne was the daughter-in-law of Marcel, and that was a tough spot to be in when you were married a few days before your 20th birthday and pretty much didn't know how to boil water. Having a French chef for a father-in-law made for some tense visits but my mom was never one to back down from a challenge. She not only learned how to cook beautifully but she knew how to entertain. She threw parties that were the envy of the neighborhood and every detail was attended to - including a guest list that threw the most dynamic people into a room together. She did love a spirited debate! I got my love of cooking from both my father and my mother but my love of entertaining was definitely from Susanne, who couldn't have enough dishes, tableware, beautiful flowers from her always lush gardens and great food with great company. It's sadly ironic that losing my mom in 2009 was one of the things that spurred me on to do something different with my life -- she would have loved Marcel's so much and she would be so happy to see me doing what I love. It has been such a pleasure to meet so many customers who share her passion for bringing people together and creating just the perfect setting for doing so. All of us at Marcel's truly enjoy helping you find just the perfect thing whether it is for a weeknight meal for family or a once in a lifetime special occasion. Thank you to all of you who let us into your homes to cook, create, and celebrate. And Happy Mother's Day, Mom -- I couldn't have done this without you. FULL STORY. HEF TALK by Jamie This will be my first Mother’s Day without my Mom, Florence. She was a vibrant, outgoing, outspoken no-nonsense kind of Mom. Always said whatever was on her mind, good or bad, but she also taught me everything I know. My mom wasn’t the best cook in the world. In fact if it wasn’t cooked to death, my Dad wouldn’t eat it. But when she made her specialties, she was spot on. 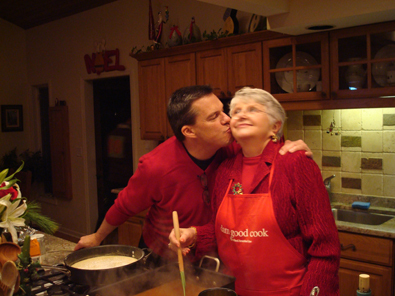 When I grew up, got married and had a family, my Mom would come over and we would work in the kitchen to make some of those treasured recipes. I would sit on the other side of the island and ask questions as she performed each step. “How much water are you putting in that flour to make the dough?” “This much,” she replied, holding up an ordinary drinking glass that appeared to be half full. “Well, how much is that?” I would ask again. “I don’t know….a good cook never measures. You’ll know when you’ve added enough” Whether it was pizza dough, (she actually sold pizzas to our friend and neighbors one year), or pierogi dough, it was always the same story:”I never measure”. I have to say, I have haven’t quite gotten to the “no-measuring” point in my cooking career, but I’m getting there. So this Mother’s Day, cook together, laugh together, eat together, and measure (or don’t) while you are doing it. Thinking of you this Mother’s Day, Mom! 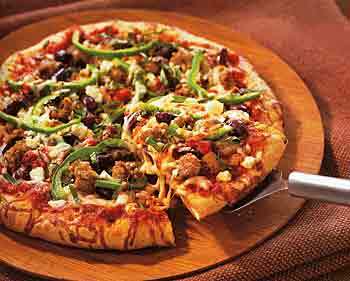 Roll out pizza dough to form long rectangle, large enough to cover large rimmed sheet tray. Spread pizza sauce evenly over dough. Spread cheese and dot with sausage. Spread green peppers and olives. Bake for 25-30 mintues or until golden brown. Remove, let stand for 5 mintues. NOTE: A steel rimmed sheet tray, not-nonstick or aluminum works the best to produce the crispy crust. Dissolve yeast in warm water in mixing bowl. Add salt, olive oil and flour. Attach bowl and dough hook to mixer. Turn to low and mix until dough forms, and cleans the sides of the bowl. Place dough in greased mixing bowl, turning to coat completely. Cover. Let rise in warm place, free from draft, about 1 hour, or until doubled in bulk. Punch and let rise another hour. I have an absolute love of gardening. The word "miracle" gets tossed around way too much at my house, but honestly, the miracle that is Mother Nature, thrills me every spring! My crazy behavior starts early April (this year it was March). I take our dogs out at 6:00 AM and start poking around, lifting the leaf cover from the early arrivals like Bleeding Heart and Virginia Bluebells. I love the first sight of hosta "fingers" poking through the chilly ground! I never spoke "baby talk" to my boys, but on any given morning you can find me in my backyard, on my hands and knees cooing and babbling to my green babies!! One of my favorite happenings this year was the return of my parsley! While it is a perennial, I've never had good luck with it returning. This year, both my curly and flat leaf varieties came back, and are already enormous! At Marcel's, this has been the Spring of the green smoothie. Since opening last Fall, several staff members have purchased a Vitamix blender. We carry a fabulous book called "Green Smoothie Revolution" by Victoria Boutenko and she really sings the praises of this phenomenal piece of equipment. 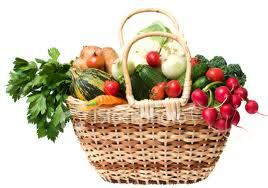 I've become fascinated with the health benefits of parsley, kale, spinach and all things green! Every morning, two cups of greens, an apple, banana or a cup of berries, water and ice and voila, in less than a minute, I've done something really really good for myself! 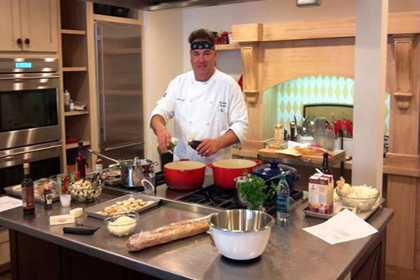 Chef Robin Nathan will be teaching a class, "Vitamix, Beyond the Smoothie" on Thursday, May 3 from 6:30 - 9:00. Join us! Happy gardening and Happy May! Mix flour, eggs, salt and 3/4 cup water together to form dough, adding more water as needed to form a ball. Let dough rest for 1/2 hour. In a sauté pan, cook bacon lardons over medium heat until just before crisp (app10 min), place on paper towel. In bacon drippings, brown onion until translucent, (approx 6-8 minutes). Add sauerkraut and caraway seeds. Heat until sauerkraut just starts to brown. Let cool. Cut dough ball into 6 equal pieces.On a floured surface, roll out dough to form a rectangle about 1/8 inch thick. Cut dough into 8 pieces. Drop 1/2 to 3/4 teaspoon of sauerkraut mixture onto on side. Brush dough edge with water, fold over other edge of dough, crimping edge with fork to seal. Continue process until dough and sauerkraut are gone. In rapidly boiling salted water, drop in 10 to 12 pierogis and cook for 8 minutes. Remove with slotted spoon to cool. In a sauté pan, melt 1 T butter and cook pierogi, (3 to 4 at a time), until brown and crisp on each side. Serve immediately with a sprinkling of kosher salt. With spring upon us, Mother’s day approaching and milestone celebrations taking place under the sun’s warmth, look to your garden for inspiration. Start by picking one or two colors to set the tone. After choosing your color scheme, you will want to find some pieces that will add texture. For example; tulip-yellow and hydrangea-blue placemats, plates and napkins can be balanced by a neutral burlap tablecloth and a runner made from large, overlapping hosta leaves. Add another layer by placing several vases of varying heights with fresh cut flowers and herbs from your garden…this combination is darling! Urns or terra cotta pots can be used as serving pieces. Finally, place vintage seed packets or cleverly wrapped “herb bouquets” at each place setting for your guest to take home. Your party will live on in your guest's memories as they cultivate the seeds given or cook with the herbs tended by your hands. So, go surprise your guests at your next party by turning the mundane into the magical. 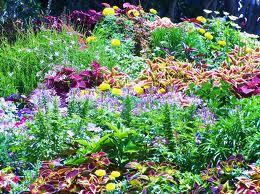 The magic is growing in your garden! Gain more inspiration by attending our Free Tablescaping Demonstration on Tuesday, May 8 from 11 am to 2 pm. Call (630) 790-8500 with questions. What is a Tussie Mussie, you ask? A Tussie Mussie is a small, flower bouquet typically given as a gift. The term comes from the reign of Queen Victoria in the late 1800's when the small bouquets became a popular fashion accessory. At Marcel's, we are proud to be selling Tussie Mussies made by a local, award winning landscape artist, Brooke Ryan. A limited quantity of these precious arrangements are delivered fresh to the store every Friday and are sold for $12, including a small glass vase. Tussie Mussies last up to two weeks with regular water changes. They make a perfect gift and are a wonderful addition to your spring tablescape or kitchen countertop. Only at Marcel's! 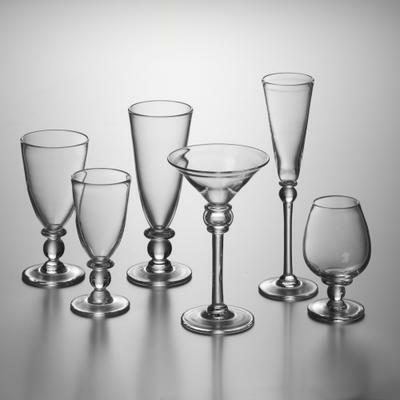 Kathy Lefty: I fell in love with Simon Pearce glassware 15 years ago when I acquired my first set of wine glasses. Their styles transcend from traditional to modern, casual to elegant, and they look beautiful with any decor. Stop in to see our selection of glassware, bowls and pitchers. Each is a work of art and ideal for any occasion. Deb Forkins: If you are like me, you love using fresh herbs in the kitchen, but hate tossing out the left-overs after just a few days. 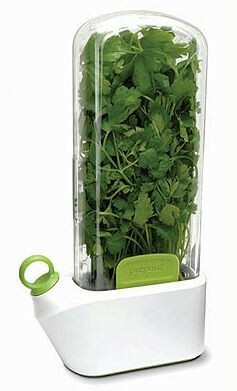 The Prepara Herb Saver changed all that for me. This wonderful little device keeps my cilantro, rosemary and even asparagus fresh for up to three weeks. 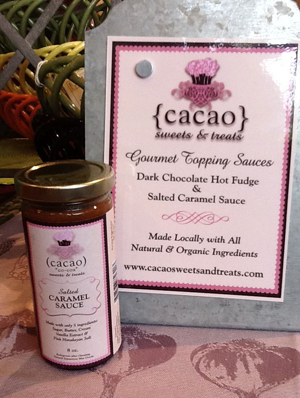 Anne Farnum: Cacao’s Salted Caramel Sauce is absolutely amazing! Warmed up and drizzled on ice cream, topped with crushed pretzels and a sprinkling of sea salt… IT. IS. THE. BEST. I have given it as hostess, coach and teacher gifts and everyone raves. Come in and get yours today! Looking for the perfect Mother's Day gift? Look no further for inspiration to honor mom. Chef Katie pays tribute to mom in Oh Baby! (5/6) and Mother/Daughter Luncheon (5/9), Chef Kelly in Thanks Mom! (5/11), and Mom & Me (5/12). May offers its book club classes, In Mother's Kitchen (5/22). Put a modern twist on grandma's favorites with Chef Jamie in Something Borrowed (5/10). 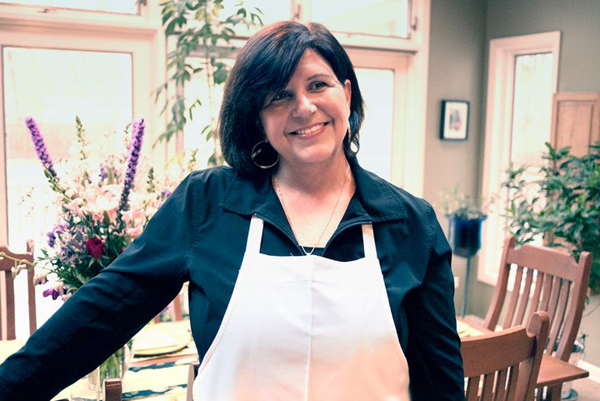 Chef Katie dishes up fresh inspiration for weekday meals at Weeknight Cooking (5/02) and Short Cuts (5/15). It is never too early to lend a helping hand in the kitchen; the teen series of classes continue with Pasta (5/20). Join Chef Robin as she shows you how to take full advantage of a kitchen workhorse, the Vitamix (5/3). To celebrate seasonality, Chef Coleen showcases the artichoke in All Choked Up (5/15) and shares the art of cheese making at Happy Goats (5/24). 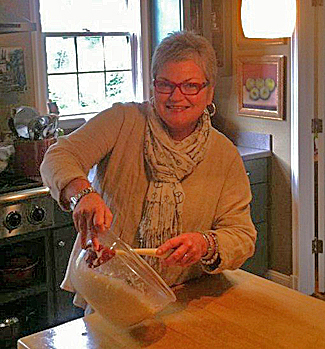 Chef Jean True treats those that just tied the knot with Newlywed Cooking (5/16). 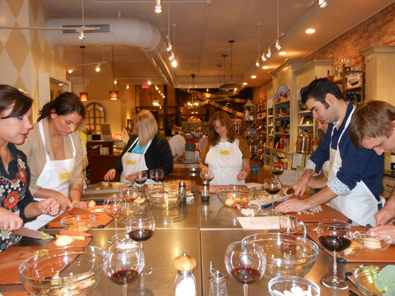 We welcome you to our kitchen at Marcel’s this May to cook, create, and celebrate! Beautiful "gifts to go" all pre-wrapped and perfect for Mother's Day! Was this newsletter forwarded to you? If you would like to be on our email list to get all of the information you need to know about Marcel's, click here to sign up!